"When am I ever going to use this?" It is a question that has plagued math teachers for decades. Now you can answer the question. The Make It Real Learning Activity Library, Volume 2 contains 110 engaging common core real-world math activities that demonstrate everyday applications of mathematics. 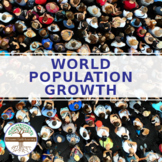 World Population Change: Do we need to be Concerned? 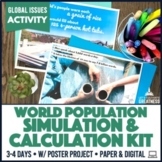 Math Activity: Using World Population for Estimation, Number Operations Do you want a fun way to teach estimation and rounding with bigger numbers? This is a four page activity and answer key where the students will use the population of various parts of the world to answer mathematical questions. 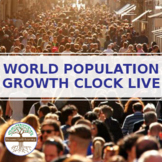 Students will construct a multi-line graph to illustrate population growth rates globally. Also, question on percent change globally for various time periods historically and generate thoughts on how the globally population came to its current situation. 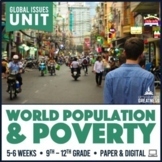 Unit world population review questions, great for checks for understanding or as an exit ticket! 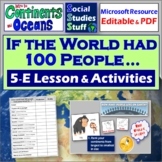 World Population webquest - all links are provided and currently work. Includes a real-world activity where students can apply skills of finding ratios and unit rates. Application activity also includes answer key, directions and printable student copy. Can be used as homework, assessment, independent practice, or a review.